While I am on my way to Oslo, you can find a new outfit post from Fashion Week in Berlin on the blog. I actually don’t know, if I mentioned that we are flying to Oslo, but well, now you know it. 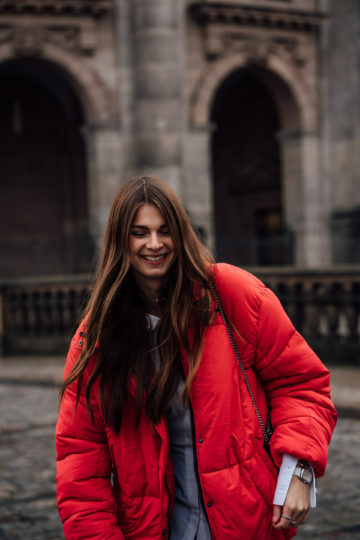 We were invited to spend five days there, to see some parts of the city as well as attending Oslo Runway – their Fashion Week. I am super excited and can’t wait to tell you more about it as well as share everything. If you want to know, what exactly we are up to, make sure to follow me on Instagram. I will share as much as possible on Instagram Stories. 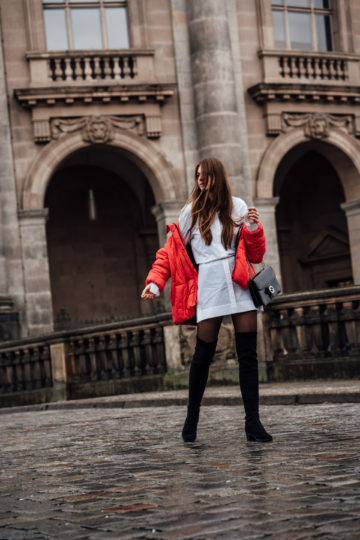 From our Oslo trip back to Berlin and Berlin Fashion Week. As I told you before, we had enough time to take pictures of all my Fashion Week outfits last week and yesterday I already shared one of them. Today I am sharing another one, and it is the one I was wearing on the day of MBFWB. I didn’t plan on sharing them in chronological order, but that’s what I have done so far. I don’t know whether I will share the two other Fashion Week outfits from Berlin next week or the week after. Maybe I will pause and share some Oslo related content next week instead. 🙂 We will see. For now, you can have a closer look at Fashion Week outfit number two. 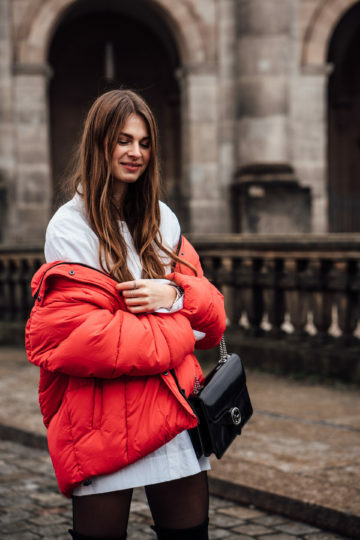 The key piece of this outfit definitely is the red puffer jacket I received a couple of days before Fashion Week in Berlin started. 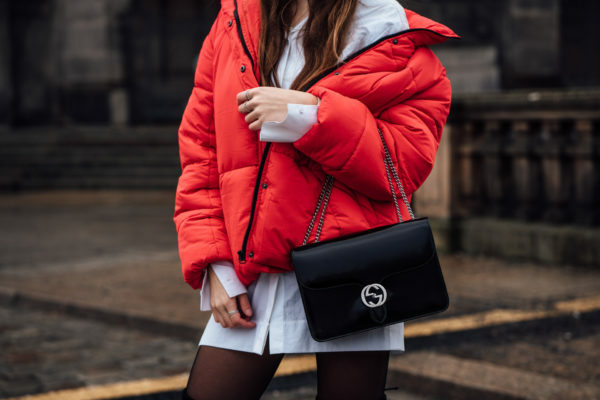 I wanted a red puffer jacket like this one for quite a long time but never bought one. I simply didn’t know whether I would wear it or not. You know, that I usually wear black, white, grey and denim. I barely wear colourful clothes, especially in winter. But sometimes a pop of colour is a nice change. Actually, a pop of colour is much needed on a gloomy day in Berlin. 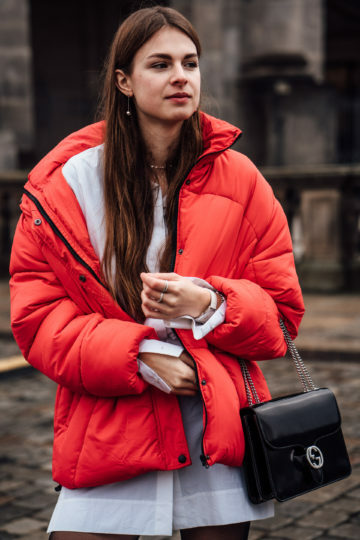 So when I planned my Fashion Week outfits, I decided that I should get a red puffer jacket. I had many possible outfit combinations in mind, so I knew, that I wouldn’t regret getting it. You might know, that I always try to think of at least three different outfits when I buy something new. My schedule on the second day BFW was quite busy, and we had to skip one of the shows very last minute. We started the day with the Sportalm show, which was a real highlight. We did not only get to enjoy the models walking the runway, but also a cheerleader team and a singer. It truly wasn’t a boring show. Afterwards, we headed to a restaurant where we could have lunch and work for a couple of hours. Those hours of working were much needed, and I was happy, that we took the time and didn’t fill every single hour of the day with shows, events or meetings. We worked on the blog, took new outfit pictures and enjoyed some healthy lunch before we headed to the Maisonnoeé show. It is one of my favourite brands, and I always enjoy seeing the show. The beginning was quite close to the end of another show, and that’s why we skipped the one before. We wanted to make sure, that we won’t miss the Maissonnoeé show. After the show, we drove to the Premium exhibition for a Microsoft event. We spent there a couple of hours, had a closer look at their newest collaboration and chatted with the Microsoft team as well as the other bloggers. We left around 7 pm, and I was super exhausted and not feeling a hundred percent. That’s why we decided to go home instead of going to the last event on our schedule. 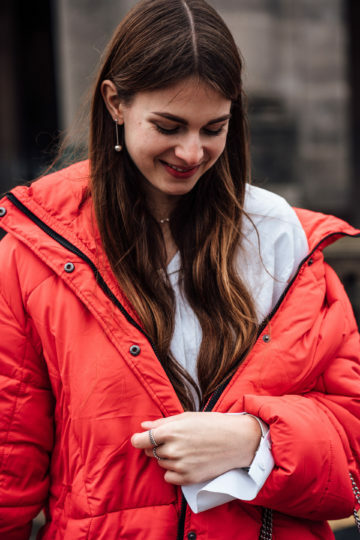 I am a bit sad, I missed it, but the next Berlin Fashion Week is in six month and summer Fashion Week isn’t as exhausting as winter Fashion Week due to the weather (as one reason).